If you live somewhere that doesn’t have a plastic-bag ban, then next time you are at the grocery store, take a moment to watch how many bags each person uses. The bags really don’t hold much weight, so there ends up being just a few items per bag or people double bag their groceries. If the person is buying a week’s worth of food, that is a lot of bags. Even if you reuse them as garbage bags, that’s only one reuse. More cities are establishing plastic-bag bans to not only help the environment but also reduce the waste that has to be stored in the landfill. Maybe your city has already established a plastic-bag ban. What about recycling? Changes in the market have limited the plastics that recyclers will accept, so more is going into the landfill. Even before that change, the U.S. recycled only about 9% of its plastic trash. The recycling rate in Europe is the highest at 30%. Maybe you’ve seen stories in the news recently about the Great Pacific Garbage Patch, or of whales found dead with stomachs full of plastic. Now, I’m no saint and am still working on weaning myself off plastic produce bags. But as a family, we are striving to be better and use reusable shopping bags whenever possible. 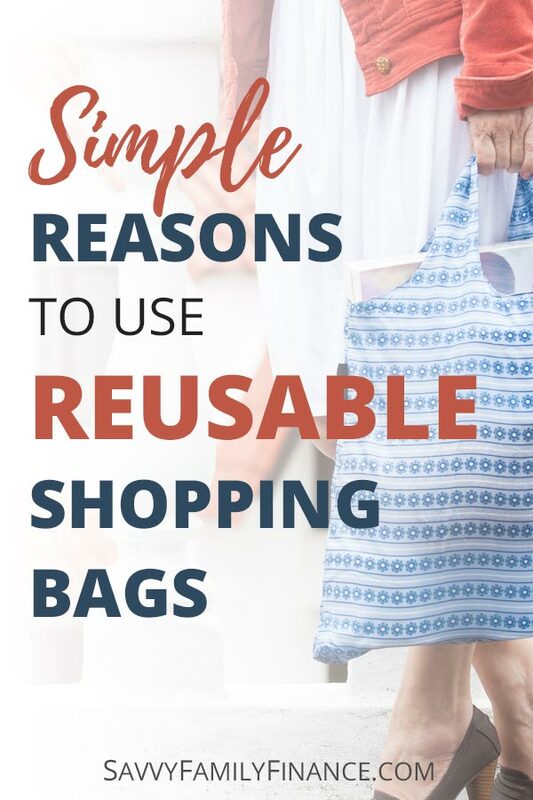 Best of all, it’s simple and there are multiple benefits to switching to reusable shopping bags. When our city implemented the plastic-bag ban, we got on board with getting reusable bags. It did take a while to find the type we like best. The free ones were bulky and not always washable. Canvas grocery bags are nice but bulky. Then we found others that we liked more. How durable are the bags? I’d say very. Of course, it all depends on how rough you are with the bags and how you use them. Us? We primarily use the bags for groceries, trips to the library, and the occasional trip to the beach. We got our first washable reusable bag 8 years ago and it is still in use. The fabric has worn a bit thin in some spots now, but it has gotten several hundred uses through the years. Plastic bags, however, have a lifespan of only about 12 minutes. And even then, it takes over 500 years to break down into microplastics that will continue to harm the environment. Reusable grocery bags not only last a long time but can hold a lot of stuff. Our larger bags do hold more volume-wise than your standard plastic or paper bags. But those and our smaller bags will also carry upwards of 40 lbs or more! Of course, I don’t want to carry a bag weighing that much, but it does speak to their durability. Carrying 40 lbs would be like carrying 5 gallons of milk in one bag! Can you imagine a standard plastic grocery bag (or paper bag) handling 5 gallons, or even 2? We tend to prefer bags of thin fabric that can be zipped up, scrunched into a ball or rolled up to take less space and are easy to stash. This means we always have a spare or two in the glove box and it’s easy to fit a few in my purse. You can often buy sets of cute foldable reusable shopping bags that are washable. ChicoBag, Envirosax, Baggu, and others all make great bags in varied sizes. How can reusable bags save you money? In many cities around the U.S. that ban plastic bags, you may be charged a 5-10+ cent fee for every paper bag you use in the store. In other cities, some stores will give you a credit of 5-10 cents for bringing your own bag. Then there is the trash cost. If you are still using paper or plastic bags when you shop, you’ve noticed how quickly they pile up and the amount of space they take up in your trash. Around here, we only get trash pickup every-other week and the standard sized can is 32 gallons, so space is at a premium. This means the more we can reduce the amount of trash we output, the more we save. Of course, money is a good motivator to reduce trash. How about just being good to the environment? Looking at the bags I normally use for grocery shopping, they easily hold about 3x what I’d comfortably put in a standard plastic bag. Each week, I’m getting about 5 reusable bags of groceries which would be about 15 plastic bags – if I’m not double bagging. Also, thus far those 5 bags have lasted 8 years. So after 8 years I’m looking at either 5 reusable bags still being used, or 6,240 plastic bags sent to the landfill. Hmmm….we’ll stick with the reusable bags. Your mileage may vary with whichever reusable bag you choose, but it’s hard to not come out ahead. Do you use reusable shopping bags? Have you made the switch to reusable produce bags as well? What has your experience been?